Located in the village of Bourron-Marlotte, this 17th-century château is set on the grounds of an ancient fortress and surrounded by 42 hectares of park. It is situated 7 km from Fontainebleau and offers a tennis court. 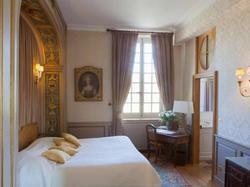 The elegant guest rooms at Château de Bourron offer a view of the surrounding park and feature antique furniture. Each offers an en suite bathroom equipped with a hairdryer and complimentary toiletries. Some rooms feature a fireplace and seating area. A continental breakfast is served each morning in the dining room. For other meals, guests are invited to sample French cuisine at ?Les Prémices' restaurant, located in the château?s former stables. During their stay, guests can relax in the château?s reading room or enjoy a tour of the château and its park. Additional facilities offered include free Wi-Fi throughout the château and free parking on site. This room, located in the castle, features a bathroom with 17th-century ceramic tiles, a hairdryer and a bathrobe. It has a large bed, oak flooring and Wi-Fi internet access. The twin bed configuration is possible, at an additional cost. This room, located in the castle, is elegantly decorated with antique furniture. The twin bed configuration is possible, at an additional cost. This suite, located in the castle, is decorated with antique furniture and offers a view of the park. This suite can accommodate 2 extra beds. The twin bed configuration is possible, at an additional cost. This double room is in the cottage 50 metres from the castle and overlooks the park. Some are on the ground floor and overlook the terrace and the park and some are on an upper level. Each room has a private bathroom. The twin bed configuration is possible, at an additional cost.